The monarch caterpillar is banded with yellow, black, and white stripes. The head is also striped with yellow and black. There are four black body extensions, two on each end of the body. They look similar to antennae. The caterpillar will be as long as 5 centimeters (2 inches). 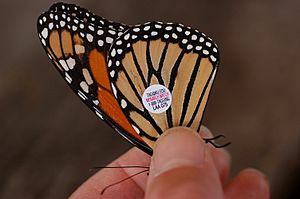 Much of the monarch's breeding habitat is not good anymore. 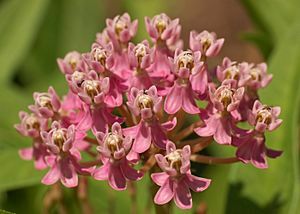 In some states and provinces, milkweed is thought to be a weed. In these places, the milkweed is killed to keep livestock from eating it and becoming sick. 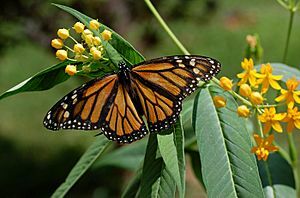 With fewer milkweed plants, the monarch does not have as much habitat to breed in. 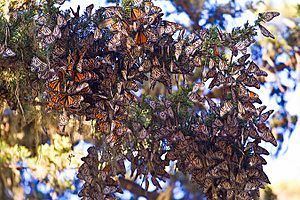 Habitat destruction has been a concern as the number of monarch butterflies that completed an annual migration to their winter home in a Mexican forest sank in 2013 to its lowest level in at least two decades, due mostly to extreme weather and changed farming practices in North America. 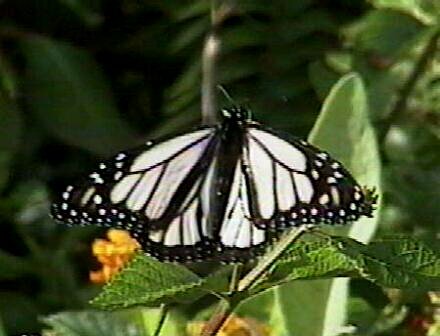 The Mexican forest occupied by the butterflies, once as high at 50 acres, dwindled to 2.94 acres in the annual census conducted December 2012. 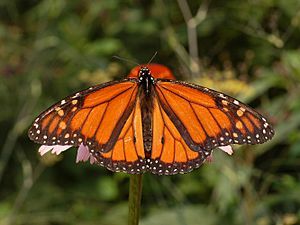 Monarch (butterfly) Facts for Kids. Kiddle Encyclopedia.